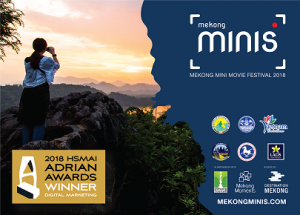 The Hospitality Sales & Marketing Association International (HSMAI) will honour the Mekong Tourism Coordinating Office (MTCO) with a Gold Adrian Award for digital marketing excellence displayed in its 2018 Mekong Mini Movie Festival, a social media campaign that has earned a global reach of over 7 million people to date. Recognised globally as the largest and most prestigious global travel marketing competition, The HSMAI Adrian Awards celebrates industry innovators who successfully find and create new ways to influence growth in the hospitality industry as a whole. This is the second HSMAI Adrian Gold Award within the past four years for the Mekong Tourism Working Group and its secretariat the Mekong Tourism Coordinating Office. The previous award recognised the 2015 release of its www.mekongtourism.org website, which incorporated a number of innovative features including the popular e-library and the Mekong Tourism Contributor Program. “The Adrian Awards celebrate travel marketing innovators whose awesome creativity and hard work are integral not only to the success of their companies but to the continued growth of the hospitality industry as a whole,” said Robert A.
Gilbert, President and CEO of HSMAI. The MTCO will officially be honoured during the 62nd annual HSMAI Adrian Awards Gala on January 22, 2019, at the New York Marriott Marquis, at which nearly 1,000 hospitality, travel, and tourism marketing executives are expected to attend.